If you’d like to cut down the size of the iTunes library, this CleanMyMac module can help you easily. It removes redundant data like iOS backups stored on your Mac, updates of iOS software, and various broken downloads. If you’re a music lover, iTunes Junk may also find many cached album artworks, which sometimes occupy a noticeable chunk of disk space. 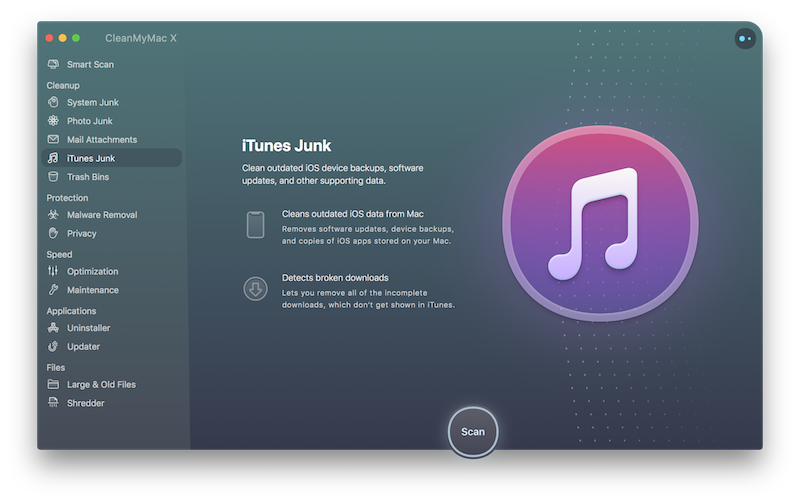 Scan: Navigate to the iTunes Junk module and click Scan. iOS Applications: When you download iOS apps to your iPhones or iPads, iTunes saves backups of these downloads on Mac. Removing these files from iTunes won’t affect your devices. Consider keeping the old copies of iOS apps in case you're planning on using old iOS devices further and syncing these apps to them. iOS Device Backups: All your iOS device backups are stored on Mac. However, information on your devices is changing constantly, and backups get quickly outdated. You can easily get rid of old backups without losing any valuable data. The latest backup is never selected for removal automatically. iOS Software Updates: Every time you update your iOS devices via cable sync, multiple update files remain on your Mac and increase the amount of wasted space on your disk. Removing these files will do no harm to iOS devices or Mac. iTunes Broken Downloads: Due to a number of reasons, your Mac may store a collection of files with incomplete data. These may be broken podcasts, movies, audios, etc. Removing these files is safe. iTunes Cache: Every time you listen to music in iTunes, it caches album artworks to reach them faster next time. The folder storing these artworks may take up gigabytes of space. Moreover, when you listen to Apple Music streams, your Mac gets stuck with a growing number of artwork cache files. Removing artwork cache files is absolutely safe because they are recreated next time you are listening to music. CleanMyMac smart-selects for removal all types of items found in iTunes Junk, except iOS apps and the most recent iOS backup for each app. You can exclude some of the iTunes Junk submodules from the scanning process. Go to CleanMyMac X → Preferences → Scanning tab and deselect the checkboxes of submodules you don’t want to be scanned. Note that your choice also affects the Smart Scan module.